PHOTO BY MARIANA C. MORALES Family and friends joined the students in their protest at the Homer Watson Boulevard and Block Line Road roundabout that has had more than 20 accidents since it opened in August. Hundreds of St. Mary’s High School students and supporters came out on Oct. 17 to protest the controversial Homer Watson Boulevard and Block Line Road roundabout. 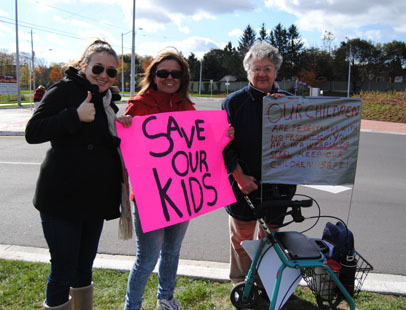 Their voices were partly heard by regional council members Oct. 26, who agreed to put “stop for pedestrian” signs at the roundabout and reduce the speed limit coming up to it to 50 km/h from the current 70 km/h. However, the students also wanted an overhead walkway. “We’re protesting so we can get an overhead walkway for students,” said Jessica Desbiens-Joyes, a Grade 10 student from St. Mary’s High School who participated in the protest along with her friends. There have been 26 collisions reported on the roundabout since construction finished in August. And, a 16-year-old student suffered a broken leg after being hit by a Grand River Transit bus while crossing the street there. The protest was organized by Rachel Jacquot, a Grade 11 student who wants an overpass so students can cross safely. Her mother, sister and grandmother supported the protest and were at the roundabout since 8 a.m. when the event started. “I think it’s awesome what they’re doing; the roundabout is really dangerous,” said Sharon Jacquot, Rachel’s mother. Waterloo Regional Police officers were at the protest to ensure the protesters did not distract drivers and to also help pedestrians cross the road. Although a pedestrian overpass would ensure the safety of students, it would be costly. According to John Shewchuk, chief managing officer at the Waterloo Catholic District School Board, it would cost around $2 million to construct. However, this answer didn’t make Karleen Noftall, a Grade 12 student, happy. “I think they’re waiting for someone to die,” she said. PHOTO BY MARIANA C. MORALES. The protesters' message was loud and clear to anyone driving in the roundabout. The students are demanding the construction of an overhead walkway, so pedestrians can cross the roundabout safely.